The recovery in US office property rental market some were expecting has not materialized. The market is stable, but vacancy rates have stalled and net absorption rate (the rate at which rentable properties are leased out) declined in Q2. Reis Reports: - High hopes for an ongoing recovery in the U.S. office sector were frustrated in the second quarter as vacancy remained unchanged at 17.2%, this despite a respectable 4 million plus square feet increase in occupied space. Expectations for higher rents were similarly dashed with the quarter’s feeble showing of just 0.3% gains in both asking and effective averages. As a result, rents still remain stuck at levels last seen in 2007. 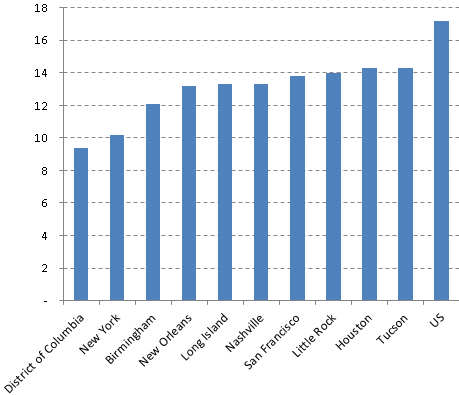 The tightest rental markets in the US continue to be in DC and NYC. 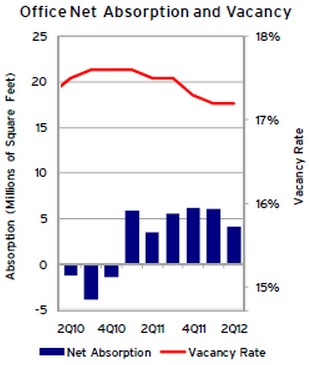 The chart below shows vacancy percentages by area. Some may find it a bit surprising to see Tucson (instead of say Minneapolis) on that list.